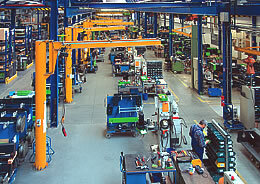 slewing jib cranes with technology from STAHL CraneSystems. Whether in a marina or at a manual work station, in a chemical plant or on a production line: slewing jib cranes are the cost-effective solution for many work areas. Safe working loads from 63 kg to 10,000 kg, with push or electric trolleys, with chain or wire rope hoists. Naturally, higher safe working loads and off-standard solutions for particular applications are possible. The high-quality slewing jib cranes are built for you by one of our certified crane building partners. We would also be glad to recommend a suitable crane builder in your region.